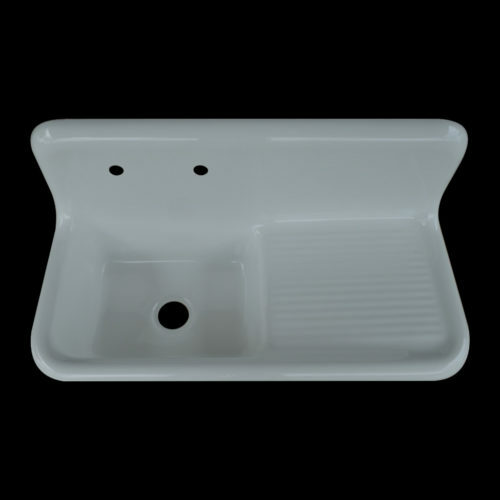 This exclusive NBI design reflects appreciated input received from our customers seeking a large single basin design. 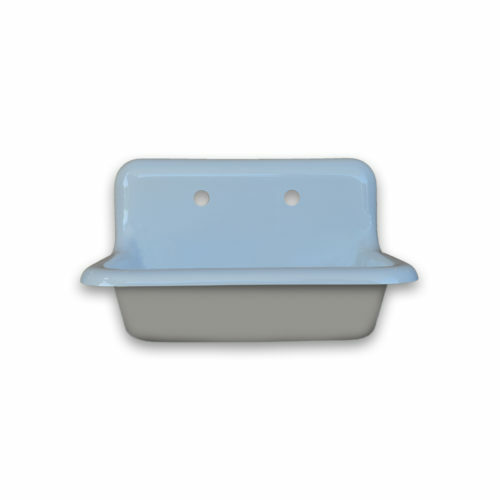 This unique design will make a great addition to a busy cooks kitchen or laundry room. 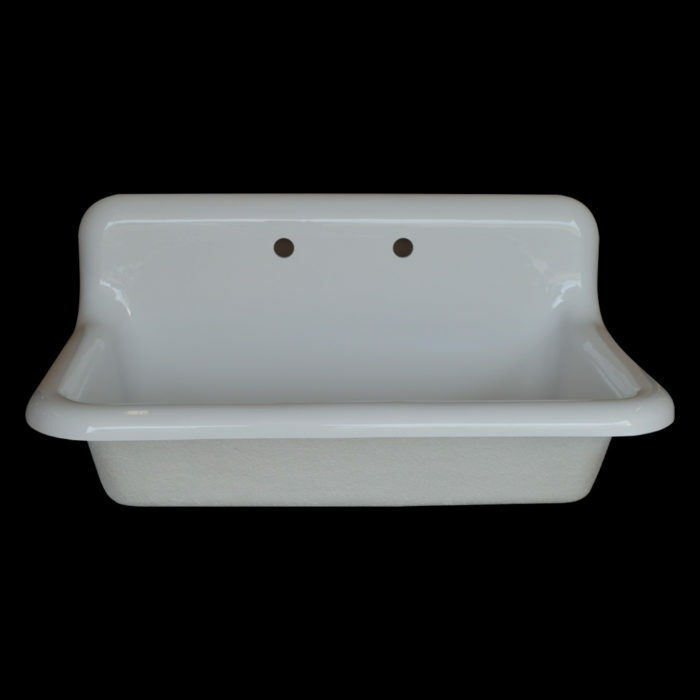 The large and spacious single basin affords plenty of room for those items that can be difficult to wash in a divided basin design. Featuring a beautiful rolled rim and a mid-height backsplash that will accommodate a traditional wall mounted faucet without having to sacrifice a window view from above. 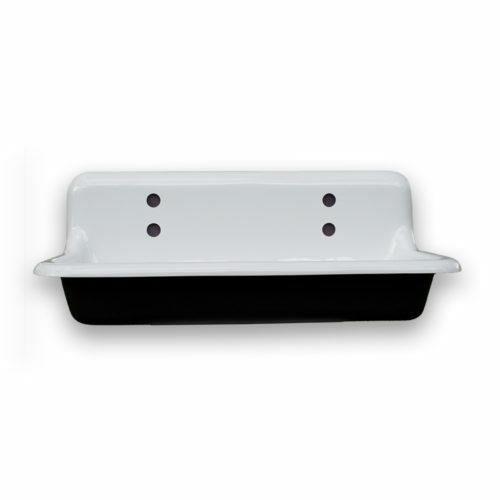 The centered drain outlet is drilled to a standard 3.5″ diameter and is waste disposal system compatible. 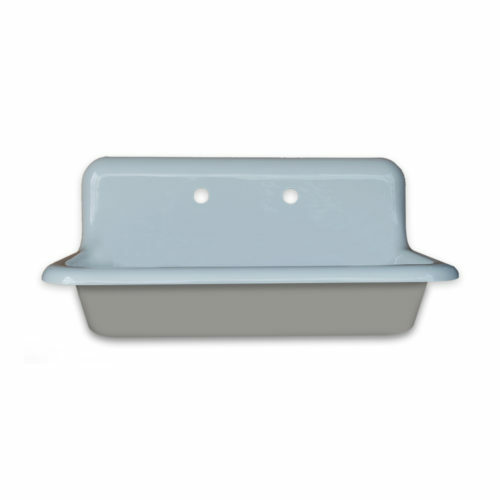 Manufactured in-house exclusively by NBI from durable reinforced cast acrylic to achieve excellent durability and ease of care while maintaining a vintage appeal. Quality assured by our five year manufacturers warranty and your satisfaction guaranteed or your money back per our 30 day return policy. 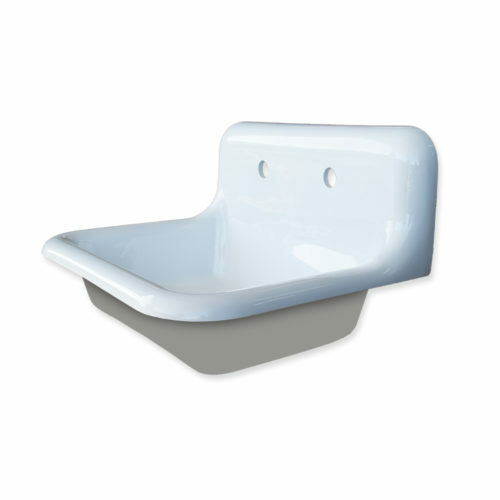 Large single basin for washing and rinsing. Drain outlete drilled to a standard 3.5″ diameter. The overall backsplash height from counter or mount surface to the top edge of backsplash is 9.5″. 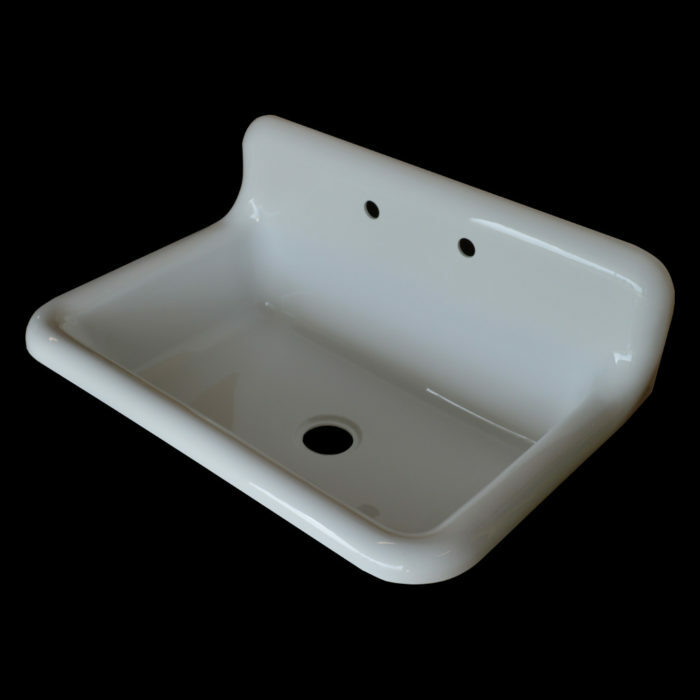 Holy Cow this is the most GORGEOUS sink… I really wanted a “real” vintage sink and found one (they are super heavy) but the re-finisher told me that kitchen sinks just don’t hold up when re-finished, I was heart broken, I wanted a early century kitchen sink. NBI saved my dream!!! I will admit I was leary and was even afraid to open the box when the sink arrived ( shipping was super fast and the sink was well protected for shipping ). I unpacked my sink today it is ALL I could hope for and more, a lot thicker material then I was afraid it would be ( there is NOTHING flimsy about this sink ). This sink is heavy duty and BEAUTIFUL!!! 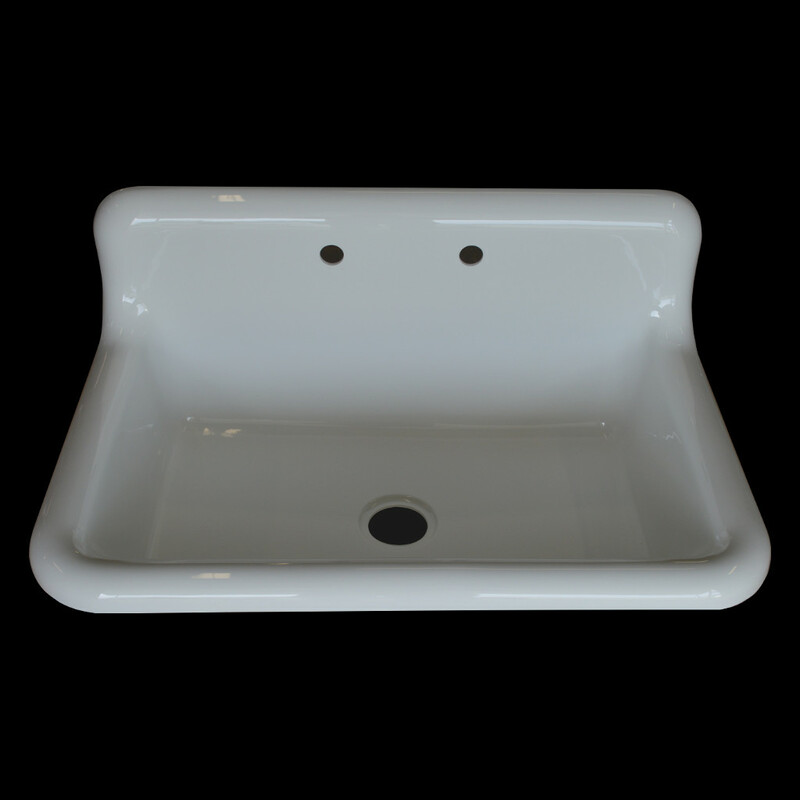 I LOVE my new sink…. THANK YOU NBI for making my dream kitchen possible! Gorgeous! Love my new sink and faucet!! I really, really, really like my sink. After months of waiting, I finally found a contractor who would renovate this kitchen in what was apparently a very uncommon style. The sink was installed today by a plumber who had never seen a sink like this one. It must have been easy enough for him, because it looks great. Was TOTALLY blown away with the Kingston Wall-Mount Faucet in bronze, handling like it was a precious gem. The counter top guys were so impressed, they wanted to use my ideas to suggest to other people. Granted I do live in Alabama, so these NBI styles may not have yet been discovered. I LOVE NBI. 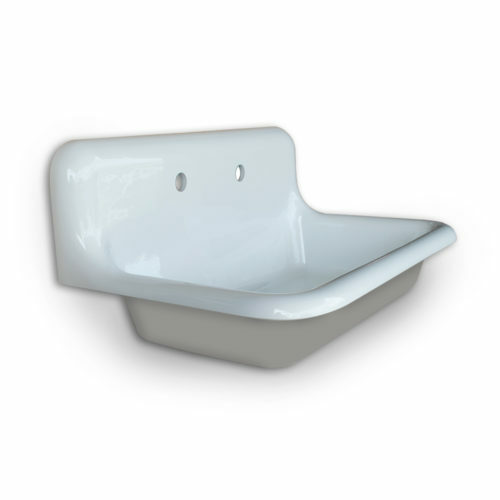 Maybe one day they’ll make some ultra cool bathtubs! This sink left me speechless! It is a work of art and I LOVE it! Our kitchen is still a work in progress, but I wanted to wait until we painted the cabinets to send you a picture, because it would be a drastic change. There isn’t a thing I don’t love about it. The hardware matches excellently. Thank you so much! Your professionalism and helpfulness made this process even easier. I will forever be grateful I found NBI! Love this sink! Put it in our remodeled 1930’s kitchen. 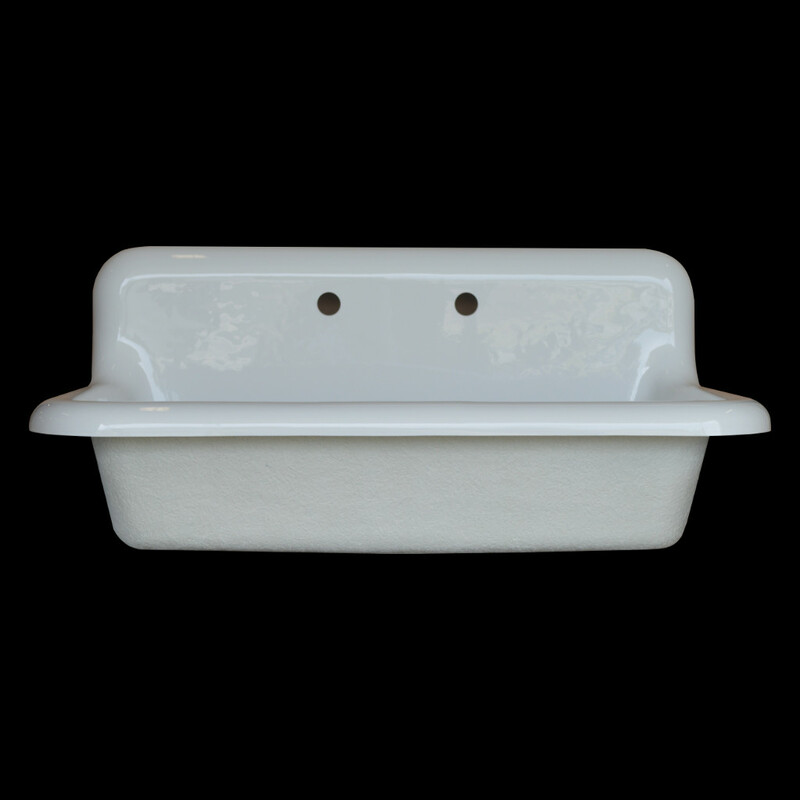 Had wanted a cast iron sink, but we are aging do it yourselvers and knew we could never deal with the weight of the sink. This solved our problem. I painted the outside of the sink a dark turquoise with chalk paint, to disguise the fiberglass look, then mounted it on a pipe stand. It looks wonderful! So proud of it and so far super easy to keep clean. Bought an American Standard retro style faucet to go with it. It is very much in keeping with the age of the house but with a cool updated twist. Hope it lasts for years and years! My sink arrived very quickly and in great condition. It truly is gorgeous! The material seems quite durable and it’s nice and light (in comparison to the cast iron models). The only thing I would caution prospective buyers is to make sure your plumbing can be set up to accommodate the faucet. 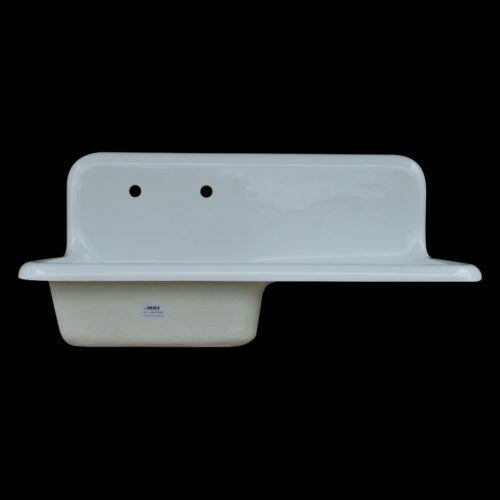 That has been our only challenge installing the sink as we live in a cold climate and the sink is on an exterior wall. Would definitely recommend NBI. Could not find an original cast iron sink in good enough condition for my new kitchen. 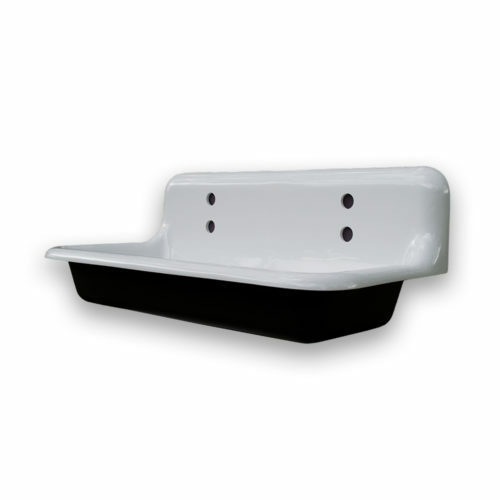 Thankfully found NBI sinks! Beautiful reproduction, and only 45 pounds. My sink has been installed for a year and has been a great addition. I am an Interior Designer and would recommend this product to any of my clients who wants a ‘vintage’ sink in their space. Clean up is easy, but after a year small scratches & dark marks appeared from metal pots. Easy remedy is Novus Polish sold on this site. With a little elbow grease scratches are removed and sink looks like it did a year ago when installed. 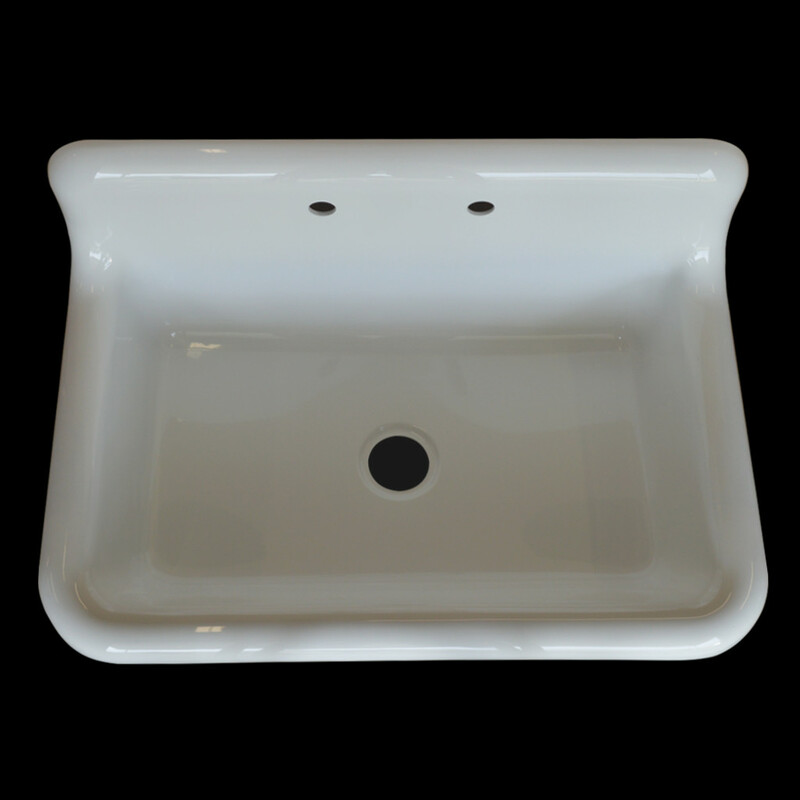 Love, love, love my new kitchen sink; THIS is a farmhouse sink! I’m grateful that NBI was able to reproduce the early century models. Since I have a window over my sink, I was concerned about the backsplash height. After speaking to a staff member, it was a not a problem. Everyone loves this sink. I also bought the Kingston faucet/spray to complement the sink and it looks amazing. Shipping & packaging was great. NBI is an excellent company to work with…thank you so much!! My sink is beautiful in my newly remodeled kitchen! Everyone who sees it says they have never seen a sink like this, with the built-in backsplash – including my contractors! It gives the kitchen in my 1910 home the retro look it needed. I could not be happier with the look and finish. The light weight of the sink made it so easy to install too. So glad I selected this one instead of one with an apron which is so popular now.